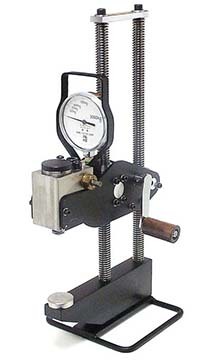 The KB Series from Newage are lightweight, portable Brinell hardness testers. The KB Series is manually-controlled and these hardness testers are ideal for virtually any size or shape of metal specimen. The KB Series hardness tester applies up to 3000 kg load on a 10mm ball, making a visible indentation that is read using a Brinell scope or our B.O.S.S. system. The calibrated accuracy is better than 0.5% of the applied load. Simply place the specimen between the anvil and test head, manually crank the test head downward onto the specimen and apply the desired load using the hydraulic lever. Learn more about the KB Series on www.hardnesstesters.com.